This restaurant-quality tool is an absolute must for any tomato lover. 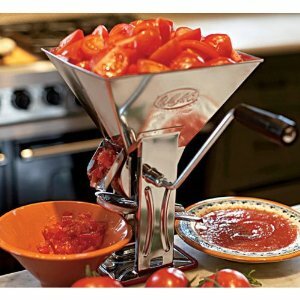 It naturally seeds, strains and peels as you turn, leaving you with beautiful puree for sauces, soups, salsas or pastes. Just attach it to your counter or tabletop with its screw clamp base - and go to town! Durable stainless steel with a polycarbonate handle. Made in Italy. Click the button below to add the Gulliver Stainless Steel Tomato Strainer Made in Italy to your wish list.